Yeah! Isaac slept through the night last night. This is the third time in the last two weeks. Although he slept peacefully during the night without waking, I still get up two or three times to make sure he is breathing and his Amazing Miracle Blanket is still snug around him. Sleeping through the night also means that I missed the 3:30am episode of The Cosby Show (to which I have become addicted to since Isaac’s arrival). I genuinely felt a twinge of disappointment when I woke up this morning, realizing that there was no nighttime feeding and that I had missed the Cosby Show. Right now Nick at Night is showing the final season and we are very close to the last episode where Theo graduates from NYU, everyone is living in the house again, the doorbell is still broken, and general hilarity ensues. But I guess I can miss that for a baby who sleeps from 8pm until 7:30am. Favorite CD: Infant Calm by Prerecords, specifically track 4 which is the vacuum Cleaner Waltz and sometimes track 2 which is the Hair Dryer Hum. If you have an infant or about to have one—you need this CD. Once we turn it on, any fussing or crying immediately stops. The Isaac update for today is that we think he is getting ready to roll over. Tobe was rolling Isaac onto his side/almost stomach last night, and then Isaac would flip himself onto his back again. The first time he did this, Tobe and I cheered so loudly that we scared him. After doing that “half roll” several times, Tobe then rolled Isaac completely onto his stomach. Isaac kept trying and trying to roll over onto his back. He would work that little hip and try to swing his leg backwards. He never rolled over completely, but we are sure it is just days away. Oh I hear the little darling now calling me over the monitor…..
On Thursday night Isaac decided he no longer wanted to breastfeed. Since birth Isaac has been having both breast milk and formula due to an inadequate milk supply. Things have been going well with that–not perfect and problem-free—but well. Then Thursday night he decided that he no longer wanted to breastfeed, he just wanted the bottle. At the time I thought it was a fluke thing. Then the same thing happened on Friday and on Saturday. Sunday we were a little successful, but then by that night he was back to flat out refusing to breastfeed. He clamped that mouth shut and arched that back and simply refused. Once given a bottle he ate like there wasn’t a care in the world. Today I called the pediatrician’s office and talked to the nurse. She confirmed what I had thought was going on: my 12 week old had weaned himself. He had figured out that the bottle was easier and gave him food a lot faster. This shouldn’t surprise me, as his father demanded food at a fast pace as well. His mother also ate quickly and then wanted down to play as soon as she was done. Impatience with eating is apparently in Isaac’s genes. All of this to say, I have decided to quit breastfeeding. I made a list of pros and cons this afternoon and decided that the benefits of quitting outweigh the benefits of keeping it up. I know that the American Academy of Pediatrics now recommends breastfeeding until the age of two, but I seriously doubt we would have done it that long anyway. Two year olds are heavy, plus I am not sure if I am personally comfortable with someone who can access such food by themselves, regardless of where you might be at the time. They also recommend nursing mothers and babies sleep in the same room (not the same bed). 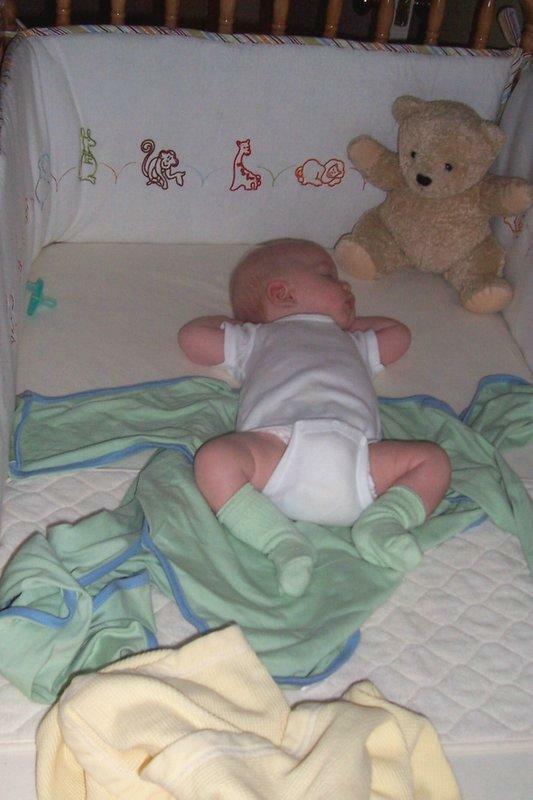 We moved Isaac from the co-sleeper to his crib shortly after he was born when we realized what a loud sleeper he is. They also recommend demand feeding and not putting a child on a schedule–I never demand fed him after those initial days and he is on a quite lovely schedule that provides structure and routine to his day (which any child with mine and Tobe’s genes wants and needs). So according to the American Academy of Pediatrics, Isaac should be listless and have failure to thrive. As you look at these pictures, you can see how sad and upset he is. Who knows, perhaps next week he will decide he no longer wants to lay around and will get up and start crawling…. Isaac recently celebrated his Granny’s 85th birthday and his Granddaddy’s 84th birthday the weekend before Halloween. What? Fall weather in Texas??? Well, it is official. I just checked the weather and the current temperature at 7am is 39 degrees!!! Does that mean that fall has FINALLY arrived here in the heart of Texas? Are we done with 90 degree temperatures? 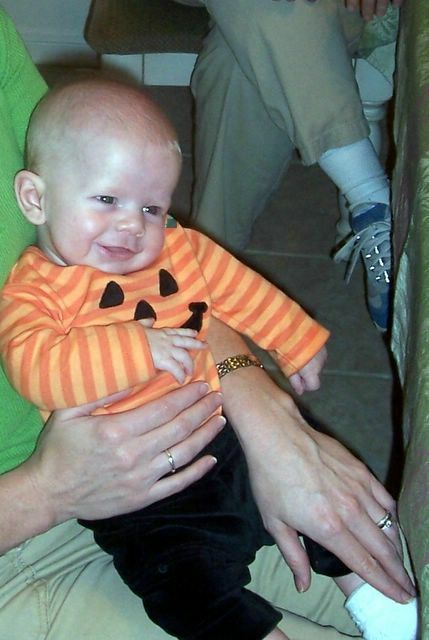 Will my child not sweat to death on Halloween when we put him in his fleece giraffe costume? I love fall. I think it is my favorite time of year. It means Halloween, Thanksgiving, and Christmas are all approaching. I can pull out the boxes and boxes of decorations and set them around the house. I love how festive things look during this time. Fall also means sweatshirt weather. I love sweatshirt weather! However, when such weather does approach this provides ample opportunity for my wonderful husband to lovingly tease me. The thing is that 99% of my sweatshirt collection comes from my college career. This was fine a few years ago, but now such sweatshirts are looking a bit dated (okay some really dated, because they have the year on them and it does not have 2000 anywhere in it). My favorite sweatshirt is from a club social that occurred before I was even in the social club. My college roomies and I found a leftover box of these sweatshirts in a friend’s attic and thought it would be cool to have them (we had a lot of spare time in college). Did I mention that this sweatshirt also has a Christmas theme and I wear it whenever it is cold, even if December 25th is not even close? In fact I have it on right now! So, yeah for fall being here! Go outside today and enjoy such great weather. 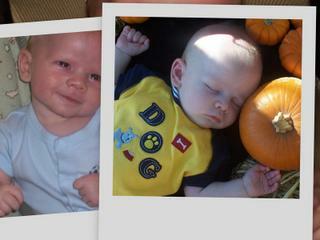 Soon I will post pictures of Isaac in his jack-o-lantern outfit and his fall overalls! Tobe and I started this blog right after Isaac was born. Seemed like a great idea late at night….We quickly figured out that newborn babies don’t leave you much time to do things like typing on the computer, eating supper, talking to your spouse, etc.. However, we have settled into life with a third member of our family quite nicely and are ready to resume this blog. Things have calmed down and feel normal now (SIDEBAR: All new mothers –and not so new moms—need to watch “Bringing Home Baby” on TLC. It makes you feel SOOOOOOOOOO much better about those first 36 hours at home with baby!). Isaac continues to amaze us everyday. I don’t know how many times we stare at him and say, “He is just the most perfect baby.” We are amazed by his little smiles and giggles–he lifts his fist to his mouth and we just KNOW that means he will one day get a PhD in some destinguished field (aka psychology) or he turns the pages on his farm book and we are sure that he can already read. Isaac does lift up his little bottom when changing his diaper if you say “Bottoms Up” and then will straighten out his legs when you put a new diaper on when we say “Legs Straight.” This might be a normal baby reflex, but we like to think he is just smart. My new favorite thing about Isaac is going into his room once he wakes up in the morning. He just smiles all over himself, giddy that we have returned. I undo his Amazing Miracle Blanket (it is truly amazing) and pick him up. He keeps his little arms behind his head and his legs tucked up the entire time I pick him up. It is just too cute.